This Friday on the Trinidad Guardian’s front page, PSC Chairman Professor Ramesh Deosaran was quoted as saying the crime plans have failed. I didn’t even know we had a crime plan presented to us, far less multiple ones. 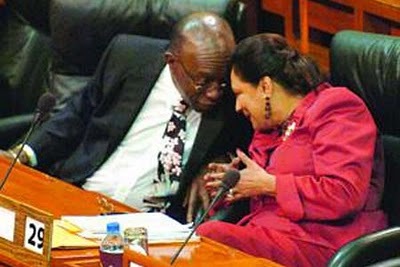 What I do know is that since being appointed Minister of National Security, Jack Warner has announced the coming of a crime plan and even released a long list to the media of many crime initiatives that are under consideration. But to date, neither Warner nor the National Security Council has come forward and outlined for the country what will be the actual thrust to stem criminal activity in the country. And I mean all kinds of criminal activity: from corruption in public office, to the drug trade, to gang warfare to murders to robbery. Because you see, whether the government will be so bold as to admit it or not, everything is related. On the Express’s front pageas well a severed head made the waves. The last time I saw a severed head on the front page of the newspaper it was in a whisky box at a cremation site and belonged to Thakoor Boodram, relative of convicted criminal kingpin Dole Chadee. Back then severed heads were a message; this week I wondered who exactly the message was being sent to and why. And while the nation gasped with shock over the severed head left in plain view of the public, with the body some miles away in a cane field, the town of Phillipine, the Prime Minister’s back yard, was rocked by the murder of a 70-year-old grandmother ostensibly for her car. Could that car have been stolen to commit a crime? Could the crime have been drug-related? Might gang members be the foot soldiers of the drug trade? And if they are the foot soldiers, then who are the middle managers and king-pins? Anyone seeing dots that might be connectable? We are currently grappling with the possibility that our recently appointed Minister of National Security may have authorized an illegal police unit. Why is it every time Warner’s name is mentioned in the same sentence as the word Squad it leaves a bitter taste in our mouths? The news papers claim to have documents sent to them. Contracts on NFSIU letterheads. There is evidence to show that newly-appointed director of the National Security Operations Centre (NSOC) Garvin Heerah gave the go-ahead for a fleet of vehicles to be released to the New Flying Squad Investigations Unit. As soon as Heerah started commenting on the Unit, he had to go to Argentina. And clearly internet and telephones don’t work in Latin America, so he can’t be reached for further comment. Each news report or denial on the matter is carefully worded. Collin Partap, reports claim, was meant to oversee the unit; then got fired a month later for failing to take a breathalyzer test. Under his tenure the unit had no name. In the aftermath of his firing it assumed the name we now call it. 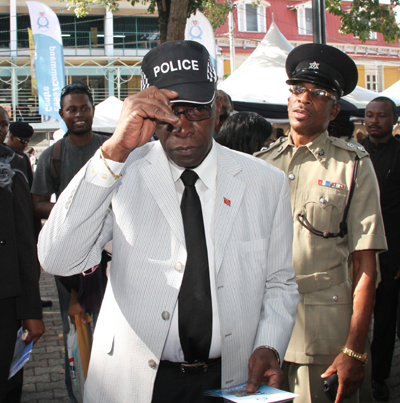 From Mervyn Cordner’s initial claim to the present, CoP Stephen Williams has been careful to say that HE, the Commissioner of Police, doesn’t know anything about the Unit. He never says the wider Police Service doesn’t know. After answering questions before the Police Service Commission last Thursday, a statement was issued that claimed they believed the Police Commissioner had no knowledge of the Unit. Not a person has yet denied the existence of the Unit or that Police know about the Unit. But everyone is denying knowledge of the Unit. 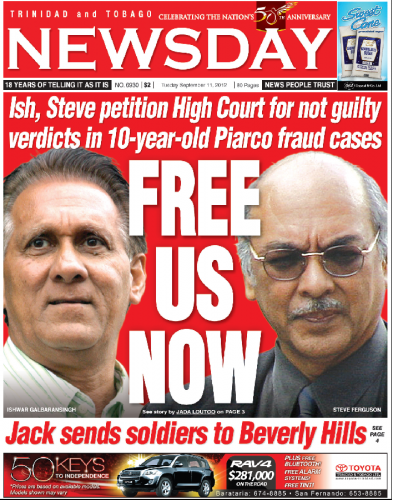 And in a place like Trinidad and Tobago it is easy to believe that an entire illegal investigative unit would set itself up, get offices and other resources from the State, even liaise with members of the Ministry of National Security, and yet, the Ministry remains totally in the dark about the Unit. This is Trinidad and Tobago, a country where an entire State of Emergency can be called without a plausible explanation. The same SoE will then be used as a crime fighting tool, target very specific neighbourhoods, arrest 8000 people without evidence, then release them; and at the end of it the country is still crime riddled and none the wiser as to the reason for the SoE. This is the type of country where the Cabinet can conspire secretly proclaim a law before the stipulated time and everyone points fingers at each other. This is a country where the Minister of National Security, a man with allegations of fraud and corruption hanging over his head, can calmly say to the country he is precepting soldiers and not a civil society body will make a sound. The same bodies that once howled for the heads of Howard Chin Lee and Martin Joseph, are now begging us to not blame Warner and give him a chance. And if the story of this country not sweet enough, we suffered the exquisite irony this week of witnessing the Prime Minister deliver a speech to the region about crime fighting initiatives; quote unknown statistics about what crime is costing us; then return to Trinidad and announce boldly that her government is NOW ready to do something about the crime situation. The same Prime Minister, who presided over the dismantling of SAUTT because it was illegal, now seems confused about the Flying Squad. So to make things better she has asked Minister Warner to investigate himself and report to her. The same Prime Minister who cancelled the OPV contracts from BAE is now seeking to find new ways to protect the borders she left unguarded for 32 months. The same Prime Minister who called Manning a dictator is now endorsing soldiers having the same powers as the police. The army whose responsibility it is to protect citizens from external attack may now have the right to attack its citizens. And Professor Deosaran thinks the crime plan has failed. I’ll ask again: what crime plan exactly?